Misimplicity is a collaboration between singer-songwriter/multi-instrumentalist Grace London and bassist Zoe Cz, two 16 year old musicians hailing from Austin, Texas. Elements of alternative-folk, indie-rock, and 90’s emo fuse together on the duos first self-titled EP, a six song reflection on the difficulty of existing comfortably as expressed through Grace London’s uniquely poetic stream of consciousness writing style. The album is a testament to the enormity of introspective thought in all its strange loops, a dissection of the wishes and regrets we hold on to; feverishly communicated and beautifully performed. Grace began her musical career by learning the classical guitar at age seven, going on to play an array of shows at coffee shops and small events before she’d reached middle school. For a short time she assumed the role of guitarist for Austin Music Award winning band Residual Kid before jumping back into her own music, recording her first album Rocketship Girl at 13 years old, a release that marked the inception of her continuing studio collaborations with Austin producer Brian Beattie. By the release of her second album, the critically praised Brains Grace had made a dent in the Austin festival circuit, performing sets at Old Settlers, Austin City Limits, and SXSW, taking charge of vocals, guitar, kick drum and drum machine. Zoe’s musical trajectory was on a similar path; the classically trained upright bassist was avidly taking the stage with various bands, including local rockers Charlie Belle. The two musicians finally crossed paths while interning at Girl’s Rock Camp during the summer after Brains release. Zoe was looking for a band and Grace was looking to get on stage with a bassist; the two almost instantly decided to begin playing gigs together. Since then they’ve developed a strong collaborative dynamic as a duo, making another SXSW showcase appearance and playing tons of clubs through out Austin. After the past year of performing together, Zoe and Grace decided it was time to become Misimplicity, a name inspired by the title of the new EP’s second track “Miss Simplicity.” The name alludes to a subtle sarcasm that’s weaved its way into Grace’s songwriting, a tonal distinction from her previous projects. Where Brains was often playful and self-deprecating Misimplicity aches with occasional tinges of nuanced humor. Grace’s frustration bites and writhes on tracks like “Little Girl,” a sludgy rock outburst that wears Brian Beattie’s presence as producer in its peculiar details, while the hypnotic melancholy of “Old Apartment” finds Grace recounting visual and emotional memories in a brood reminiscent of Red House Painters or American Football, driven by a sparse programmed drum loop and atmospheric guitar and bass. “Take me Down” is one of Grace’s most powerful lyrical moments, exhibiting a depth that defies the marginalized expectation with which young musicians are often unnecessarily held to. “I am just a little person and I’m learning as I go”; most bands of any age wouldn’t have the bravery to make such a simple, poignant statement. 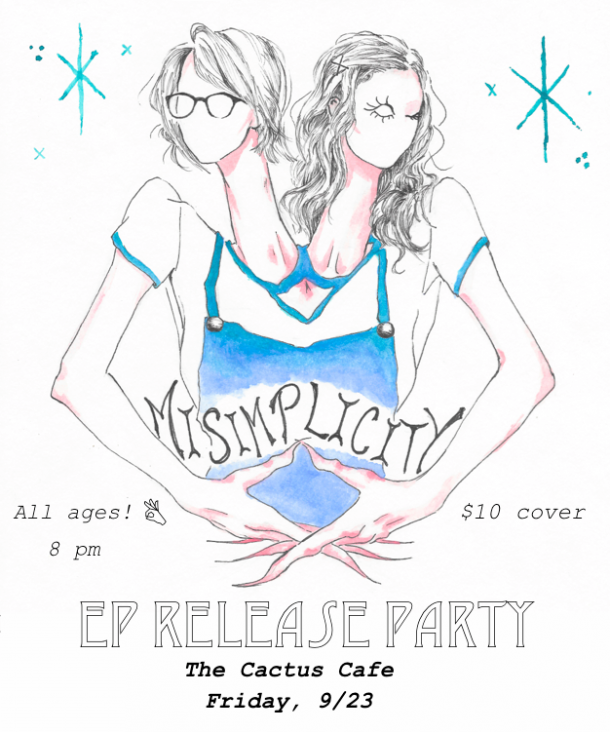 Misimplicity will be performing at the Cactus Café Friday September 23rd to celebrate the release of Misimplicity.